All products we carry are professional grade. We carry gear, tools, and equipment for the do-it-yourself crowd and professionals alike. All products meet standards for safety set forth by local, state, and federal guidelines. 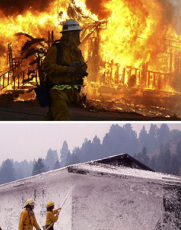 FOAMSAFE and FireShade accessories are also available to enhance your wildfire protection system in place. Click HERE for products and details. We offer Wildfire Professionals who can help you prepare for wildfires. Whether you need a community plan, or your a home/estate owner who needs to instruct or train a crew. Our consultants are professional who can guide you. Once a wildfire strikes, it's too late to worry about getting prepared. There is still something you can do! 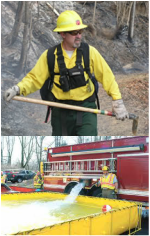 We have Fire Response Teams to help protect homes threatened by wildfire. Click HERE for more information. ©2010 Consumer Fire Products, Inc. All rights reserved.